For my Simple Pleasure beginning with N I chose North Carolina. I was born and grew up in South Carolina but have spent the last 33 years of my life in North Carolina. Since North and South Carolina once were one state I consider myself a Carolinian. The previous name, Carolina was a tribute to King Charles I of England. Later in 1792 Carolina became North Carolina and South Carolina. I have many memories as a child of family trips to Brevard and Asheville, NC for Sunday afternoons when I lived in northern SC. The trip there was a true joy for me because of the mountains. The view was fantastic. My father loved to drive and I think he really enjoyed navigating the curves of the mountain roads. I remember wondering as a child how the roads circled up to the top of the mountains and yet connected to the next mountain over. There were no bridges to drive across. Later I learned the roads curved between the mountains. The amazing views from the mountains have always been a highlight of those trips and future visits to the Blue Ridge Parkway. I remember my father telling us as we took an extremely sharp curve, “Look you can see the back end of the car as we take the curve.” By the way, our cars were little ones for the most part. So you can visualize our trusting little minds looking to see if we could see the tail of the car around the bend following us. Later I married, moved away but returned to an area near Rutherfordton, North Carolina where we had our first son. I worked in a hospital ICU/CCU there for 12 years. We were close enough to the mountains for occasional day trips there. But we were at the base of the Appalachians. Driving on the curving, steep mountain highways was also quite a thrill. We noticed there were short drive off points with a huge hill of sand or dirt at intervals down the mountains. It was scary to find out these were emergency stopping sites for drivers of 18 wheelers if their brakes gave out driving down the mountain! I am sure a car could use them too. People would drive with their foot on the brake continuously and burn the brakes out because the hill was so steep to come down. To prevent this from happening the drivers were supposed to step on the brakes enough to slow way down periodically to keep the speed safe; and under the speed that could send you flying off the edge of the mountain! Then we moved to historic Fuquay-Varina; nice two towns joined to make one. Both rich in history and lore. This brief article I wrote for Candid Slice about some of the history of Fuquay-Varina and gave help in pronouncing its name. Love Letters and Healing Springs. Two of my friends and I love to travel to the beaches of North Carolina. The beaches vary in adjoining terrain but most have sea oats and sand spanned by walkways from the roads or motels to the beach. The scenery is always wonderful for photographers like myself. Sunsets, seagulls, museums and state park aquariums are available. 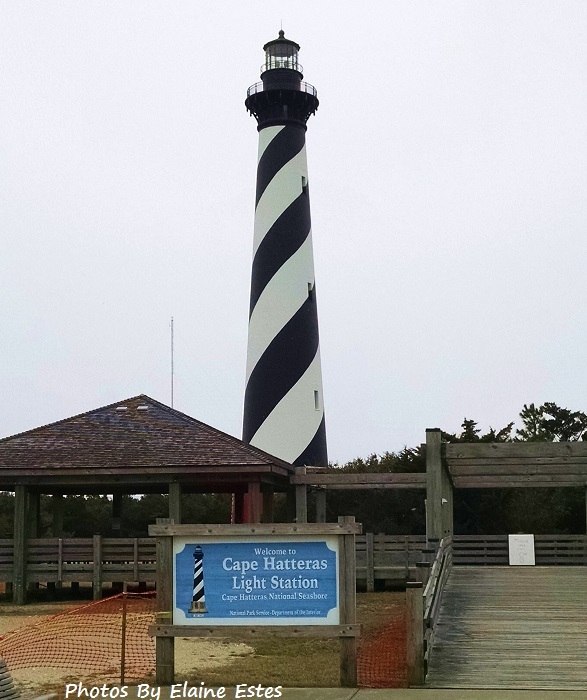 In Cape Hatteras there is a play about the landing and settling of the Lost Colony staged at Manteo, NC. Not too far from Manteo is the Wright Brother’s Museum of First Flight at Kill Devil Hills, NC. Where the brothers flight is memorialized by a lovely museum. The Elizabethan Gardens are also available nearby to the about attractions. 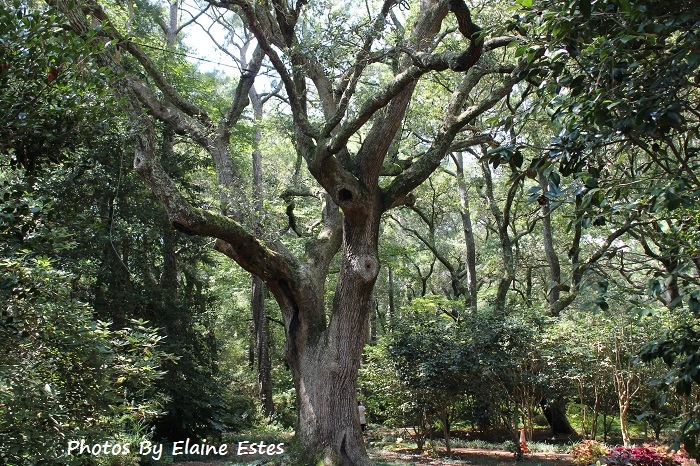 There you can see the place the Roanoke Colony landed and the oldest Live Oak believed to have been there when the Roanoke settlers arrived in 1595. There is also the ever growing and ever delightful Asheboro Zoo. Usually a friend and I visit it at least once a year. 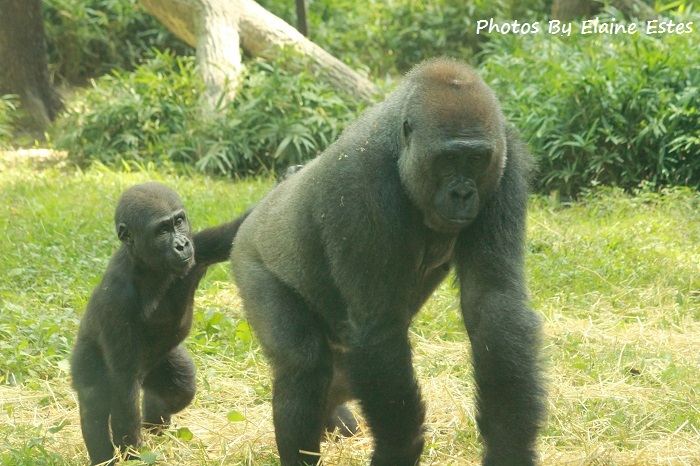 Below is the photo of a mother gorilla and her infant. I have lived in NC since 1983. I now live near Raleigh, the capital of North Carolina. There are amazing science, history and art museums in the capital alone. There are also water parks, huge shopping malls and all in one state. As you can see there are so many things to do and see in North Carolina. I haven’t even mentioned the wonderful sunrises and sunsets at the beaches. Can you tell I love my second home state? Thank you , Dear. We both have an eye for beauty, don’t we! I think for my Challenge for the letter P I will do photography for a simple pleasure! It is good to love where you live! I know NC is beautiful. I lived there for one year for a job that involved traveling all over the state. I would love to go back for a visit one day. Since my husband loves golf, i think he could enjoy it too! If you do, come see me!! I am so pleased that you enjoyed it that much! It is a great place to live with so many activities and sights to see that I didn’t even mention!! Thank you!! Good luck in whatever you are doing now! My two adult son’s still loves anime. I recognized the style of your profile picture. The name sounds vaguely familiar too. Lol. I remember that show!! Mike even bought the red coat! Legato was the one with the cross on his back? I remember the two female characters too! Surprise!! :DDDD My best friend in high school had a black version of that coat! The bloke with the cross is Nicholas D. Wolfwood, a priest holding a lot of firepower in that cross, haha XD Meryl and Milly were really cool insurance agents, lol. Mike proposed to his fiance last year dressed as Wreck it Ralph. She is 5′ and she was Penelope! He is 6’6″!! An excellent post accompanied by beautiful photographs. I would love to move to North Carolina in the future. Thank you. It is a state of mountains on one end and beaches on the other. Our weather is moderate in all seasons with occasional spikes enough to make it interesting. I have lived here since 1983. If you’ve lived there since 1983 it must be excellent. Nice and tranquil state in a picturesque setting. Absolute bliss! The Carolinas are both beautiful…and, evidently, good at basketball !! Lol, you are absolutely right about both. Thank you for commenting. I have lived in North Carolina several times during my life and have always loved it. 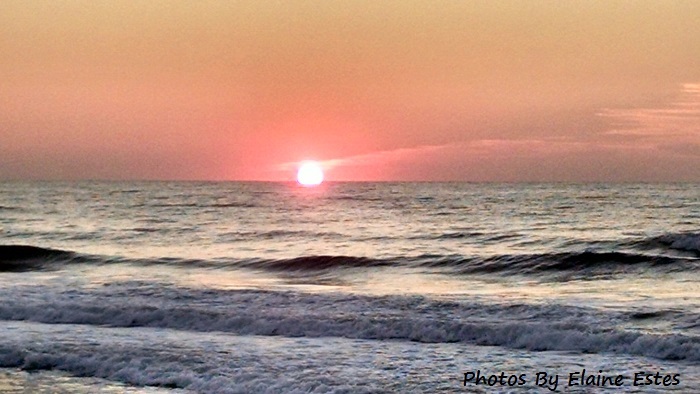 Whether the Inner or Outer Banks, North Carolina is such a gem. I can remember many years ago going out to Emerald Isle and camping on the beach for the weekend and not seeing anyone else. Hard to imagine now, but still a beautiful place. Enjoy so much your photos. Thank you. All my best to you. Have a most excellent weekend. Thank you, Johanna! Delighted that you enjoyed my photos. I am going to Carolina Beach two weekends from now. I too love the beach! That must have been an incredible experience to camp on the beach and hear the ocean at night! Thanks for sharing your experience!